5 Things to Consider When Choosing Photos for your Website. While it may seem like an easy or mindless task, the process of choosing photos for your website is a bit more complicated than you may think. Finding relevant and unique stock photos or sifting through the misnamed, disorganized archives on your companies local shared drive takes a bit of time but that, by no means, is the only step in the process. Below are 5 things you really should be considering when selecting photos for your website. 1. Determine the Message of Your Website. What’s the goal of your website, why are you creating or re-designing one in the first place? Is it to increase your current customer base? Is it a resource for your existing customers to find useful information? Or is it simply to let people know you exist? All are good reasons to create and update your current website, but they all have very different messages to the end user. Figure out what your purpose is, write it out, then think about what type of photos will help visually reinforce that message. Will our customers identify with these photos? Do the photos feel like they are consistent with the rest of the marking materials we are producing? Do they support our written content? If you said yes to all three of these questions, you likely are on the right path. 3. Is Text Overlaying Your Photos? After determining your message and making sure your voice is consistent, the next thing you need to consider is the design of your new website. Does the home page banner (or hero) image have a text overlay? Do the inside banner images have a text overlay? Do the support images in the body of the page have a text overlay? These may seem like trivial questions, but they’re actually really important in making sure all of your headlines are easily legible and consistent with the design of your new site. In the example above you can see the image has a high contrast, which makes the text difficult to read. The only way this photo will really work is if you change the design slightly to add an overlay. This can be a viable solution in some instances, but it can also take away from the overall impact of the photo and might not give the look you were hoping for. In this example you can see that the there is a low contrast between the photo and the text, making it very easy to find and read. 4. What Aspect Ratio Do You Have to Work With? Next, making sure you know what aspect ratio the design is using will save you a lot of time and heartache, especially when you find the perfect photo only to realize when it is cropped to fit in your website you can’t show everything you want. 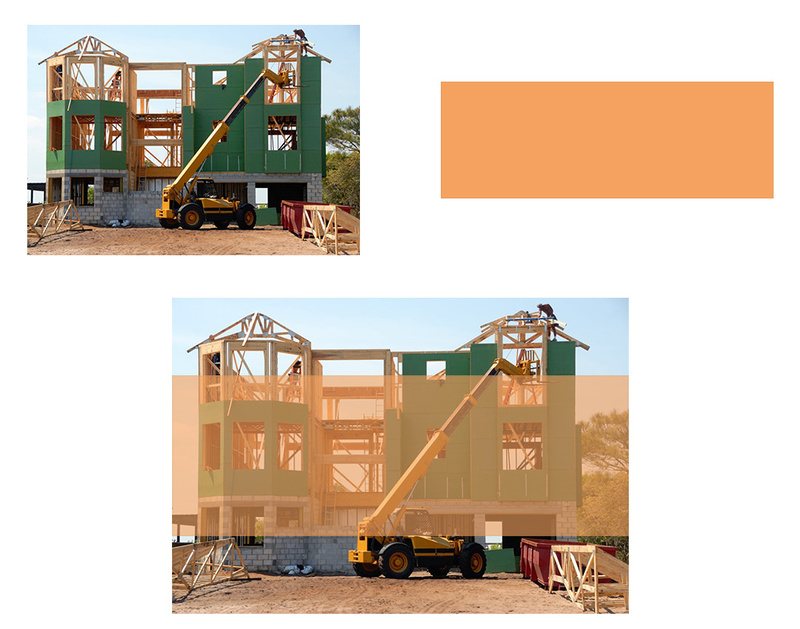 Let’s say you’re a construction company and you’re looking for photos of recent builds and the design you’re working with doesn’t have a text overlay in the inside page banner area. You find the photo below and the orange box is the aspect ratio, or size of the visible window for the banner photo of an inside page. This photo may seem perfect, but as you can see, it can’t be cropped to fit properly inside of the banner and still show the top and bottom of the building. 5. Are You Thinking About Mobile? Finally, don’t forget about mobile! In 2016 mobile and tablet internet usage exceeded desktop for the first time worldwide. We just talked about cropping your photo to the correct aspect ratio on desktop, the next thing to consider is, how does that crop effect the photo when viewing your site on a mobile device? You want to choose photos that will crop well vertically as well as horizontally. This is where things can become tricky and often require the use of a different crop on a photo or in some cases a new photo all together. Whatever you do, don’t fall into the trap of bad stock photography. These photos are everywhere and will quickly turn that beautifully designed website you worked for months on, into an unprofessional mess that most people won’t take seriously. Don’t be too literal with your photos. Photos should be used to invoke emotion and support your message. Not tell the whole story.